Bounty hunter Streeter is a string of exes… ex-linebacker, ex-accountant, ex-bouncer, and four-time ex-husband … who excels at exacting his own brand of justice… with explosive results. 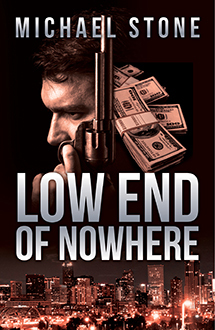 Streeter is hired by the scheming woman he nailed for insurance fraud to go after her dead boyfriend’s stash of drug money… and has to single-handedly face off against a greedy, violent pack of lowlifes and sociopaths killing their way to the big score. Tough, authentic, and right on the money. Michael Stone works the hard-boiled genre conventions with the insouciance of an old pro. Streeter is an eye-catcher. It's a cast that would do Elmore Leonard proud. A classic hardboiled novel filled with beautiful women, dimwitted thugs, and a private eye who is too cocky for his own good…a lot of fun.